Finally, the Ideal Non-Intrusive Ultrasonic Reactor with Magnetic Stirring, Heat and Cross-Flow Recirculation. 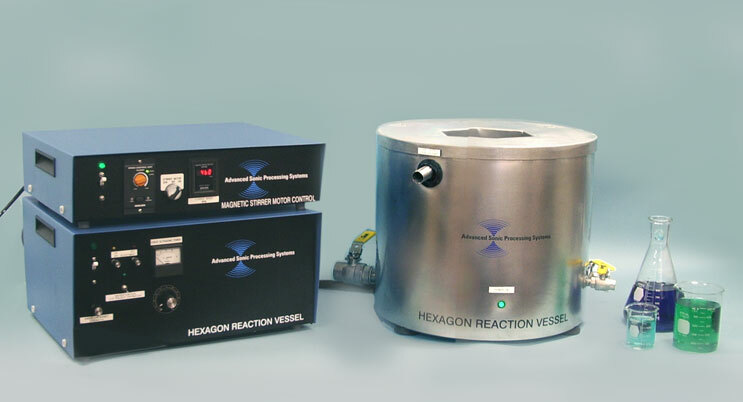 The Hexagon Reaction Vessel is a High-Powered Ultrasonic Tank which concentrates focused ultrasonic energy into the process solution. 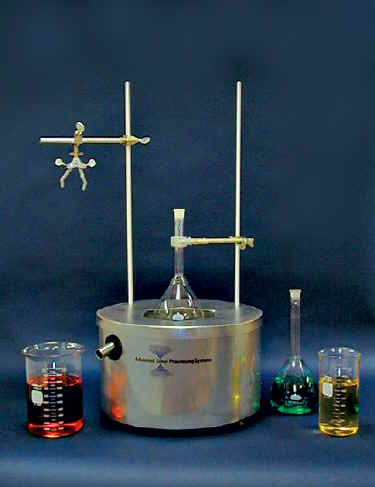 A beaker holding the process solution may be magnetically stirred while experiencing ultrasonic treatment (maximum beaker size is 4 liters). The open top vessel is equipped with two apparatus support stands secured to the HRV's support stand. The HRV open top design allows the researcher to insert specialized reaction cells directly into the acoustically energized solution. A coupling fluid will couple the acoustic energy within the tank to the immersed reaction cell. Laboratory glassware or beakers are effective in isolating the ultrasonically processed sample from the coupling fluid and ultrasonic drivers. This technique reduces the sample size and eliminates all forms of sample contamination. The Reaction Vessel's temperature can be controlled by recirculating the coupling fluid. The gradual flow of fluid around the outside of the immersed beaker/reaction cell assures uniform temperature processing conditions. We also offer Temperature Controlled systems for applications requiring precise temperature control. Ultrasonic energy from the hexagon's six surfaces focuses high-intensity sound energy into the sample for effective treatment under mechanically agitated conditions. The HRV is activated by our Adjustable Power Control Generator with Sweep Frequency Operation. The high intensity cavitation zones within the sound field literally dance around as the operating frequency is quickly varied. The sweeping action moves the intense ultrasonic wave pattern back and forth. The ultrasonic sweep action in combination with sample agitation from our internal magnetic stirring motor delivers uniform treatment for the ultrasonically processed material. We also offer Continuous Flow Reaction Cells for immersion in the HRV's Reaction Chamber. Our Continuous Flow Reaction Cells may be inserted into the HRV for exploring the HRV's processing potential with batch & continuous flow operation. 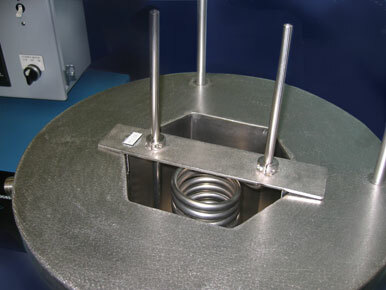 The HRV's Continuous Flow Reaction Cell is a long stainless steel serpentine coil. These cells are built with round tubing with both the inlet and outlet positioned above the HRV's countertop. CFRC Mounting Brackets are provided simplifying equipment setup. Additional Customized Reaction Cells are available upon request, (please contact our Sales Department with your requirements).